In Monsters U, there are six fraternities/sororities that compete in the Scare Games: Roar Omega Roar (ROR), Jaws Theta Chi (JOX), Oozma Kappa (OK), Python Nu Kappa (PNK), Slugma Slugma Kappa (EEK) and Eta Hiss Hiss (HSS). There are six members in each "house", meaning there are 36 Scare Games competitors total. 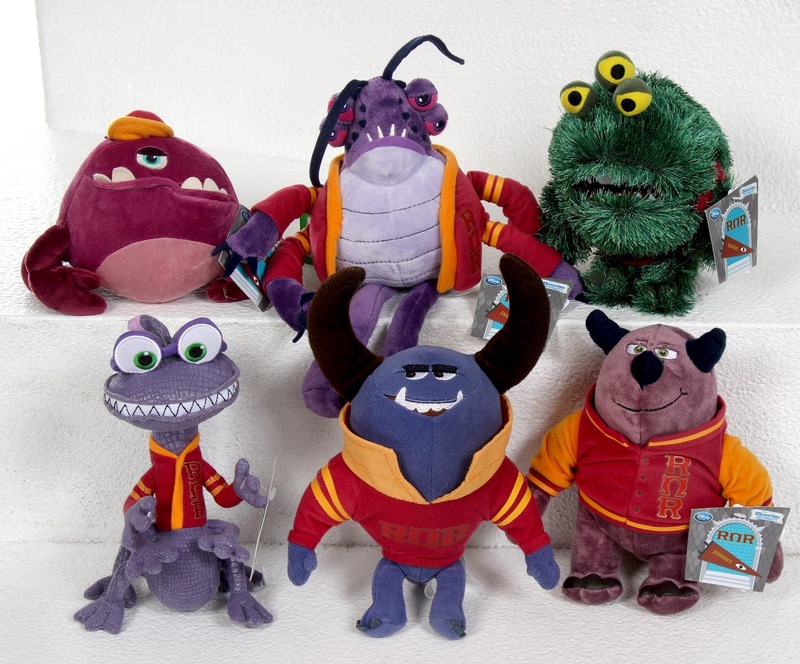 Yes, in 2013, the Disney Store released every single one of them as a mini bean bag plush! I'll be taking a look at them all over the next few days (well, most for now...more on that later). 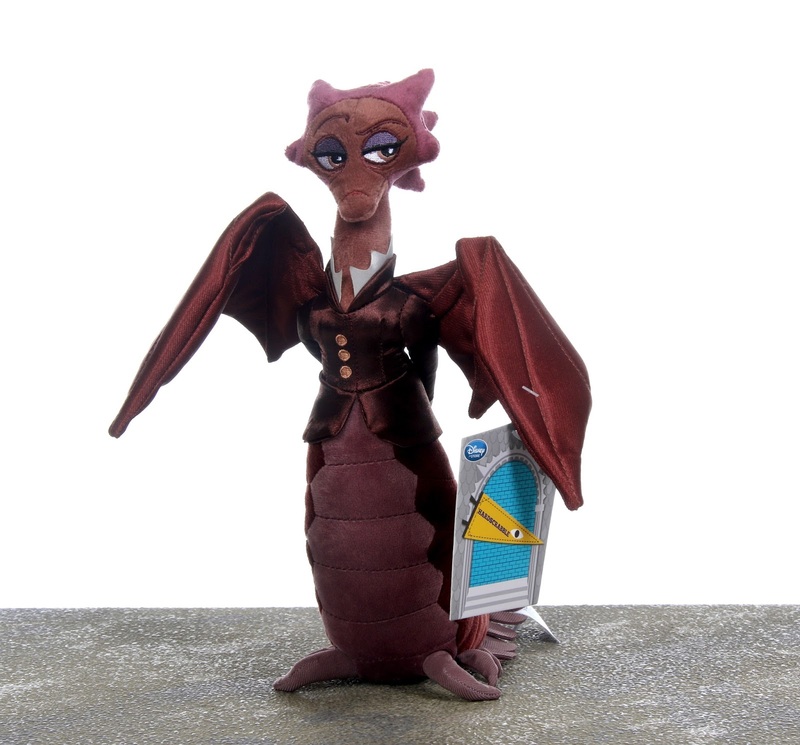 FUN FACT: Did you know that, according to MU supplementary materials, Dean Hardscrabble was part of the HSS sorority when she was in school? Interesting! The HSS fraternity sub-collection here includes members Rosie Levin (leader), Sonia Lewis, Nancy Kim, Rhonda Boyd, Susan Jensen and Nadya Petrov. Each is as detailed and awesome looking as the next! They all measure somewhere between 6" and 11" tall are are as "goth" as they come. 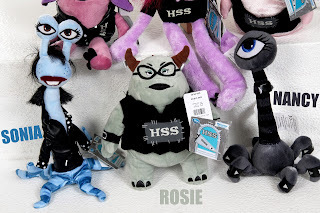 Though these character designs might not be my favorite in the film (just because I'm not so much into "punk"/"goth" type stuff), these plush were still essential to get so that I could complete the whole collection. I do have to say, they did do a great job with the little details on these (even down to Rosie's horn earrings) and I'm impressed by the materials used for the outfits and hair. As usual, these are all quality stitched, have nice embroidered features, are vibrant in color, have decent likenesses to the actual characters and are made from some very soft materials overall. My favorites in this round have to be Susan (that hair right?) and Nancy. What are yours? 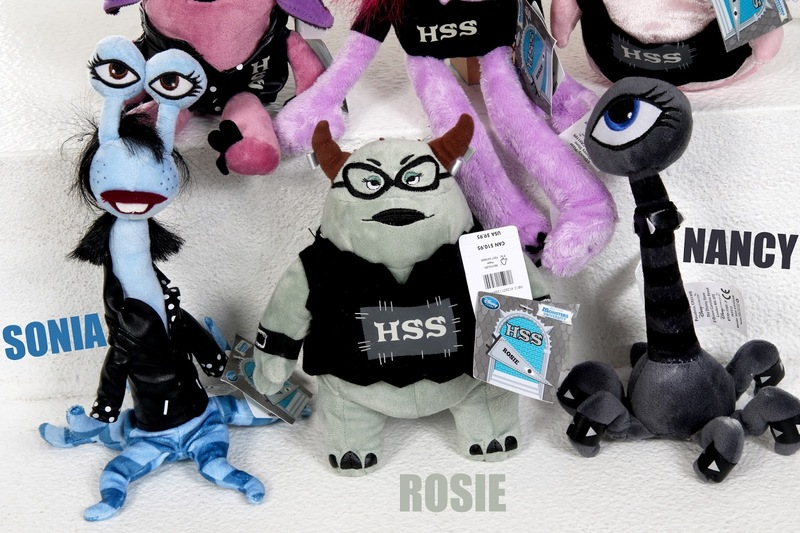 If you're a Monsters U fan, I definitely recommend trying to track these down. This whole collection of fraternity/sorority bean bags is a lot of fun! I especially love how unique most of these characters are (I mean, have you ever seen any other products of Sonia, Rhonda, Susan or Nadya?!). Just awesome. Be sure to check out current eBay listings using this direct link (that's where I got mine here) and stay tuned for much more from this collection right here soon. 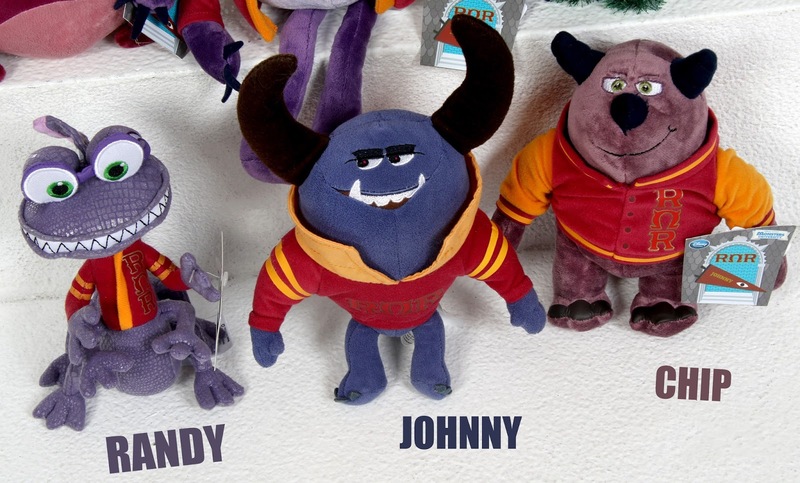 Continuing on tonight with my 2013 Disney Store exclusive Monsters University plush collection, I'm giving you a review of the "ROR" fraternity mini bean bag plush—full set of six! So far I've taken a look at the [$19.95] "medium core" Oozma Kappa, Mike & Sulley and Mrs. Squibbles characters, the [$14.95] "small core" Dean Hardscrabble, as well as some others in the [$9.95] "mini bean bag" plush category: Archie the scare pig and Claire & Brock. In MU, there are six fraternities/sororities that compete in the Scare Games: Roar Omega Roar (ROR), Jaws Theta Chi (JOX), Oozma Kappa (OK), Python Nu Kappa (PNK), Slugma Slugma Kappa (EEK) and Eta Hiss Hiss (HSS). There are six members in each "house", meaning there are 36 Scare Games competitors total. Yes, in 2013, the Disney Store released every single one of them as a mini bean bag plush! I'll be taking a look at them all over the next few days (well, most for now...more on that later). The ROR fraternity sub-collection here includes Johnny Worthington III (president), Chet Alexander, Randall "Randy" Boggs, Javier Rios, Reggie Jacobs and Chip Goff. Each is as detailed and awesome looking as the next! They all measure somewhere between 5" and 11" tall. I have no complaints with any of these guys. 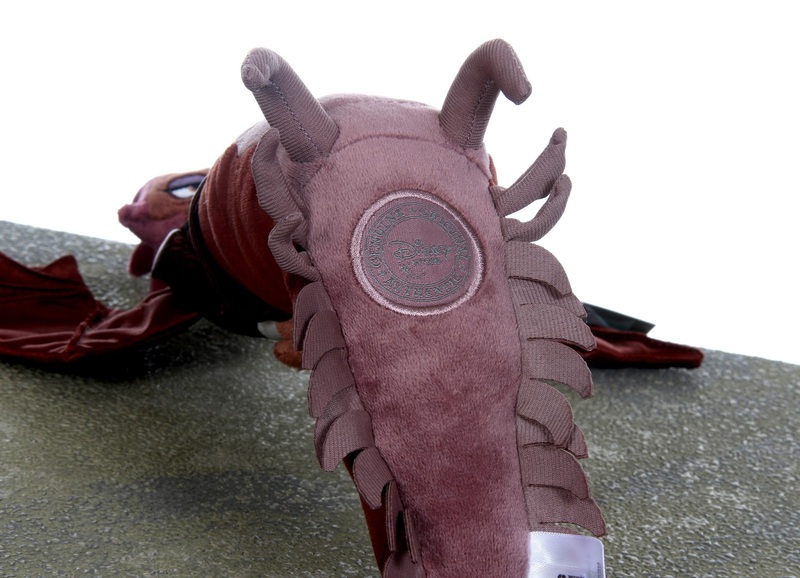 They have quality stitching/nice embroidered features, vibrant colors, decent likenesses to the actual characters and are made from some very soft materials. My two favorites have to be Reggie and Javier! Chet might round out my top three (since I find that character hilarious anyway). NOTE- You might have noticed the Chip I have here was given the wrong tag (it says Johnny). This must have just been a factory error. Honestly, I didn't collect all these frats/sororities back in the day because of the price (seriously...$9.95 x 36 would have been $358.00 plus tax). Ultimately I'm glad I held off and came back to them later since now I've been getting them for much cheaper (this set of six for example was around $20 on eBay). I'm happy to finally have them as part of my collection! 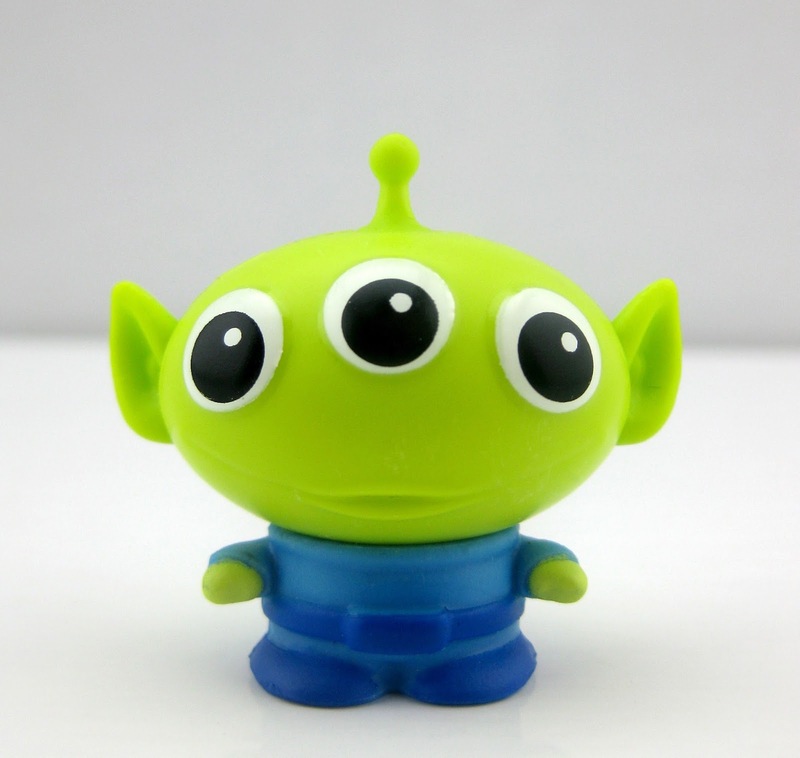 If you're a Monsters U fan, I definitely recommend trying to track these down. They're a lot of fun! I especially love how unique most of these characters are (I mean, have you ever seen any other products of Chip, Javier or Reggie?!). Just awesome. Be sure to check out current eBay listings using this direct link and stay tuned for much more from this collection right here soon. Sorry for the late post tonight guys! Between work, family time and watching the Oscars (a HUGE congrats to the whole Piper team for the win!) things were pushed back a bit. Regardless, I still wanted to get something up for you tonight. Here we have M.A. 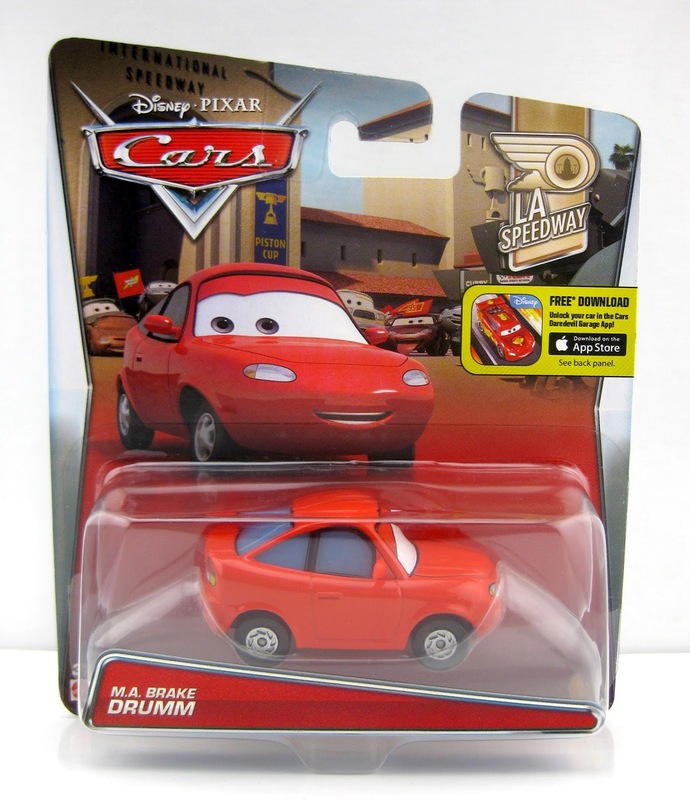 Brake Drumm, one of the more recent brand new releases from Mattel's 1:55 scale Disney·Pixar Cars collection! She started hitting shelves late last year and is part of the 2016 "LA Speedway" sub-series (#5/11). This is the first ever release of this character. As shown in the screenshot above, M.A. Brake Drumm is briefly seen in the crowed of the massive LA Speedway (near the end of the film; right before the big Piston Cup finale race begins). She is next to Coriander Widetrack (seen HERE) and the previously released Brake Boyd (seen HERE). M.A. is definitely suggested to be the mother in this shot, with Coriander being the daughter and Brake Boyd as the father (red and blue do make purple after all ;). Why they all have different last names beats me, but it's strongly implied they are a family. Interestingly I was never able to find this one in stores, so I had to finally resort to getting her online. It wasn't bad though—I think I paid around $7 on eBay. I really like the look of this car overall and I'm excited to have it as part of my collection. Plus now I finally have all three cars as featured in the shot from the film! It was worth paying the couple extra dollars just for that. If you haven't gotten M.A. here yet, be sure to check eBay HERE or Amazon using the direct link below. Happy hunting! Today I'm resuming my reviews of the 2013 Disney Store exclusive Monsters University plush with the very intimidating Dean Hardscrabble! 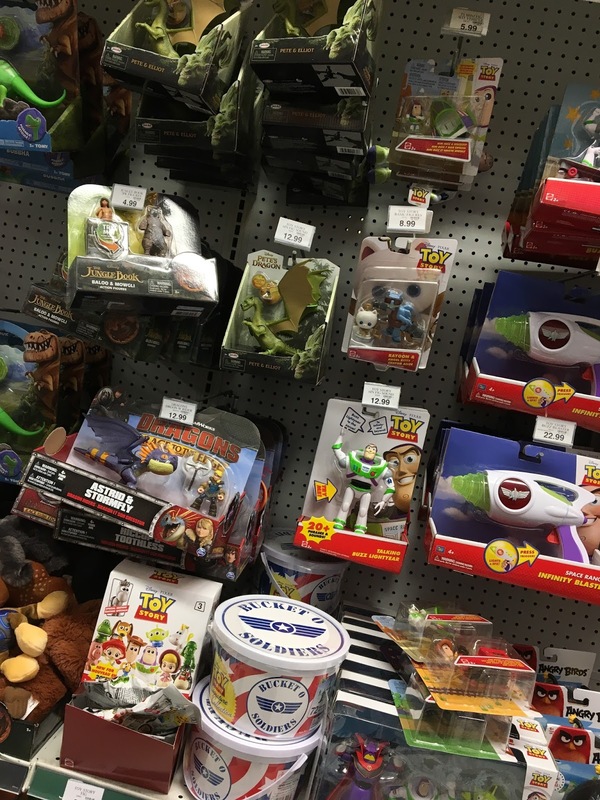 So far I've taken a look at the [$19.95] "medium core" Oozma Kappa, Mike & Sulley and Mrs. Squibbles characters as well as the [$9.95] "mini bean bag" plush of Archie the scare pig and Claire & Brock. 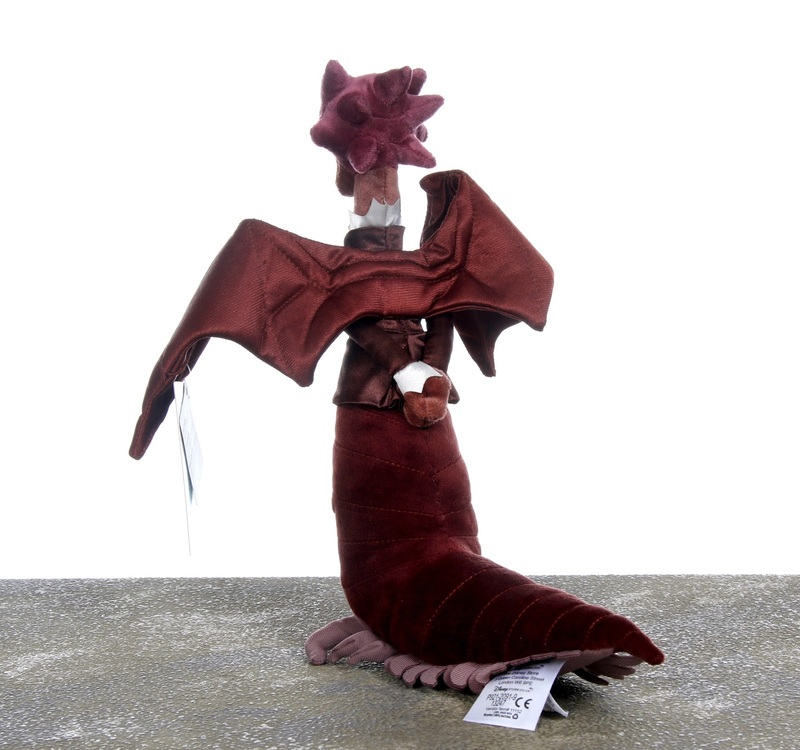 Hardscrabble here is classified as a "small core" plush, retailing at $14.95. 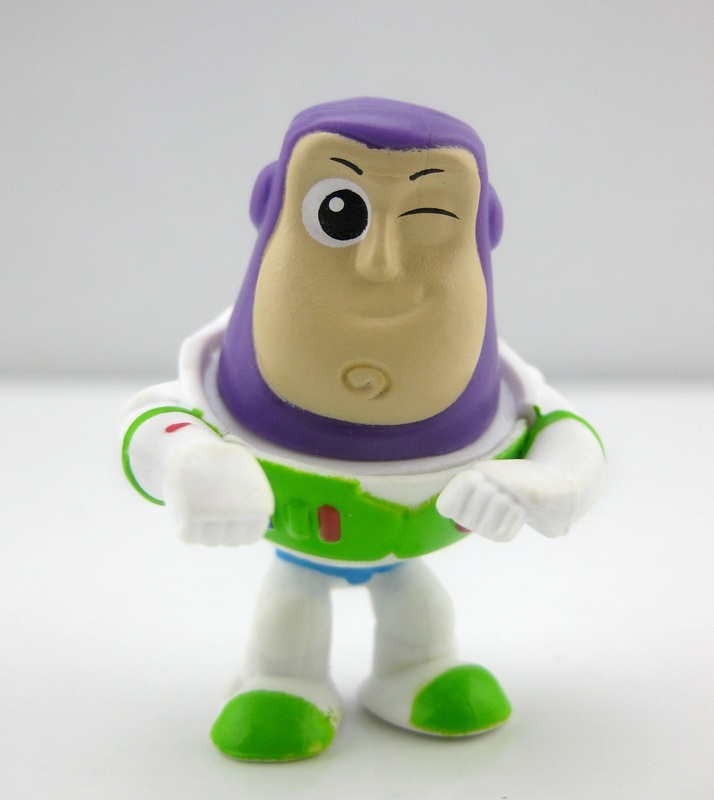 This one is about 11" H x 9" L in size and has all the Disney Store quality you've come to expect. She's soft, has a great likeness to the character, nice embroidered features and made from solid materials (I especially love the satin jacket). Though she's not technically a "bean bag" plush, she does still have some plastic pellets inside (for the weight I suppose). On the bottom, you'll find the signature "Disney Store Genuine Authentic Original" patch, which helps to ensure you that you got the real deal. 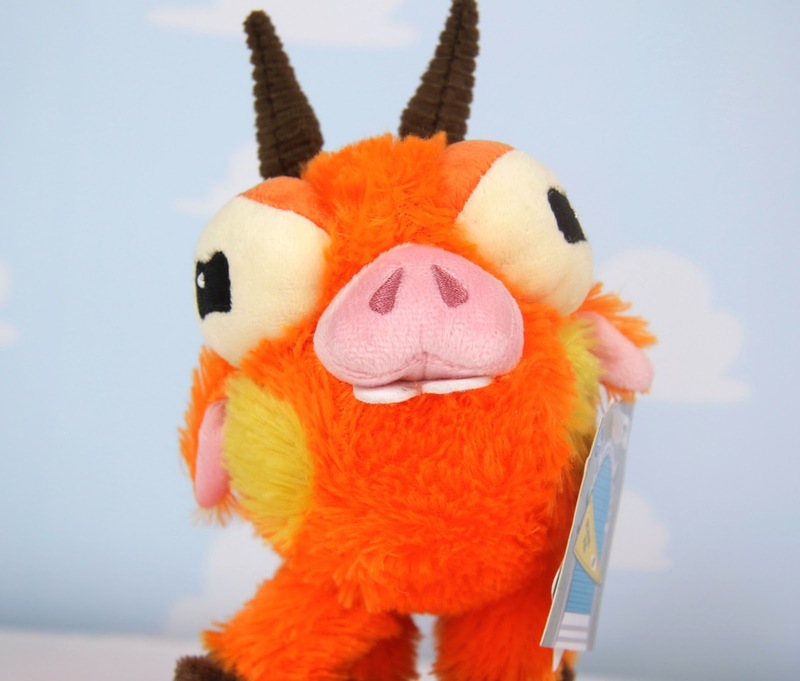 This character already has such a fantastic design and it translates very well into a plush. The creators here really captured her essence; for example, I really like the pose they gave her—proper stance with here wrists crossed in the back. Great work! Well, that's everything I have for today. Be sure to let me know your thoughts in the comments below on this or any of the MU plush! If you're interested in snagging this one for your collection, definitely check out THIS LINK to current eBay listings or Amazon using the direct link below. It's that time of year again! With the June 16th release date of Cars 3 quickly approaching (less than four months; it'll be here before you know it), it's no surprise some merchandise is already starting to hit stores. Marketing is about to be in full swing! 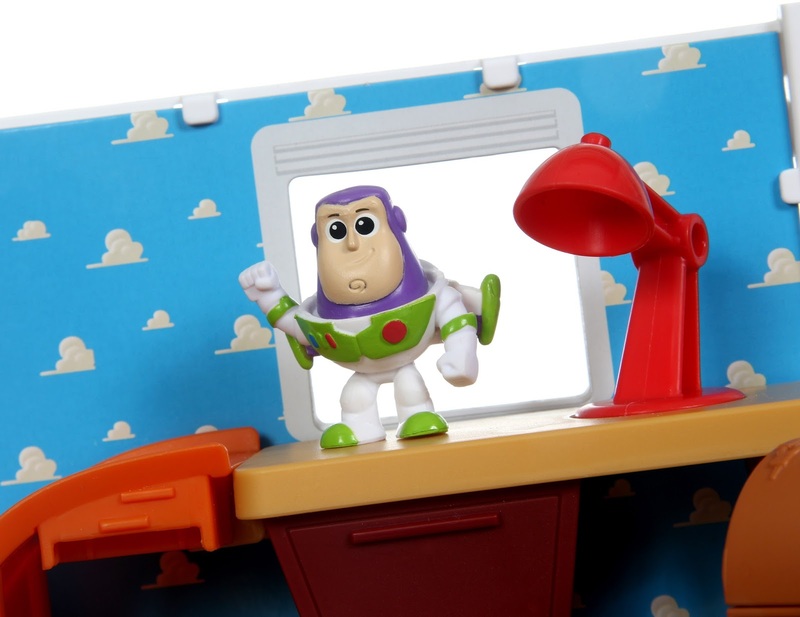 Like clockwork, early tie-in products for a new [June release] Pixar film almost always start trickling out around the January/February time frame—so things seem to be right on target. I find it funny that the first product I got for Inside Out was the box of fruit snacks and the first for Finding Dory was Kellogg's cereal...I'm sensing a food trend. 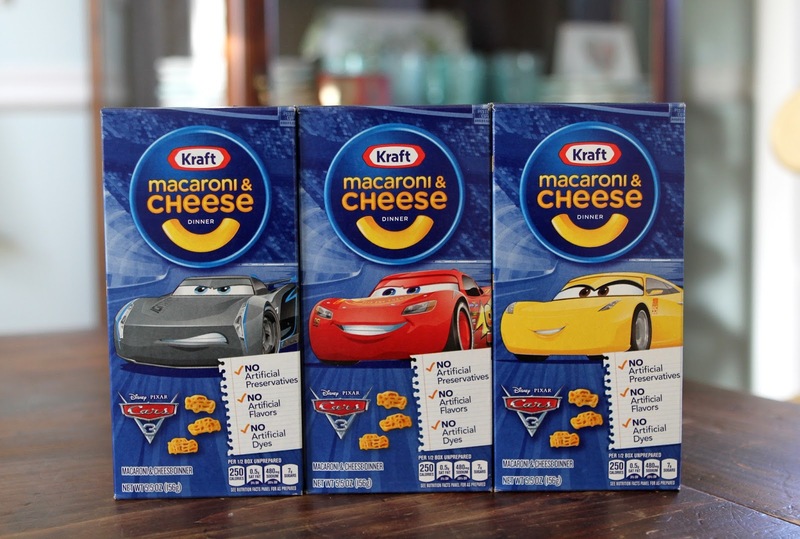 These boxes of Kraft Macaroni & Cheese are officially the first pieces of Cars 3 merch I've purchased, so the tradition continues! I stumbled upon them this morning at Walmart and was super excited; not so much for the mac, but because it means we're that much closer to the film. Plus it's cool we're starting to see the logo/characters out there on shelves. It's about to be a heck of a fun year for us Cars fans/collectors. I picked up all three packaging designs they had there. One features Jackson Storm, one features Cruz Ramirez (both brand new characters) and one features everyone's favorite cocky race car Lightning McQueen. As far as the pasta itself goes, Lightning, Cruz and Jackson each have their own design, but they virtually all look the same (I honestly can't tell which one is which). 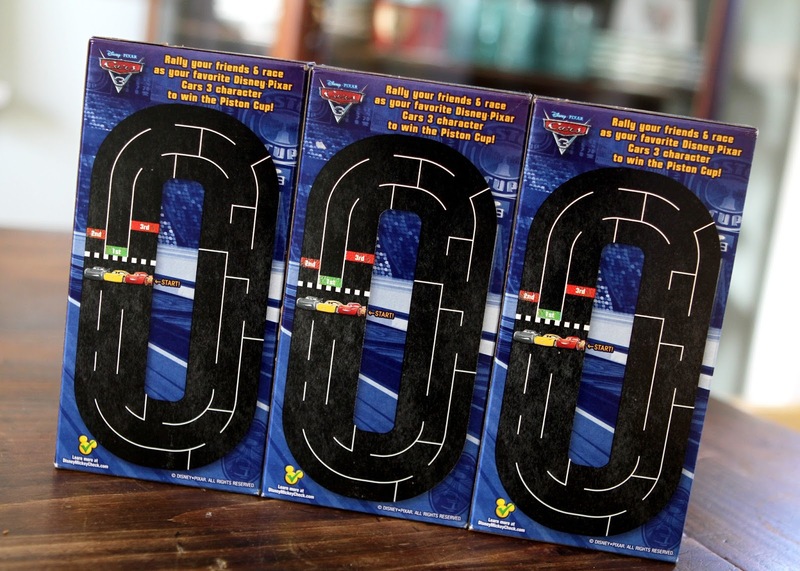 On the back of each box you'll find a race track maze activity with all three characters. Pretty neat! The kids will like that. Here he is below...he was so excited! When I pulled them out of the bag he said "Oh. my. Gosh." 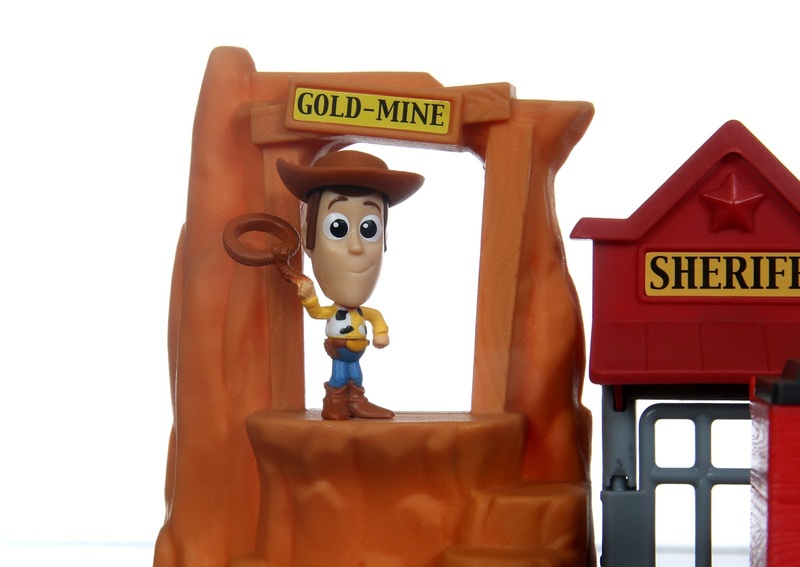 Kraft Mac & Cheese is often a given these days when it comes to early tie-in merch for a Pixar film. 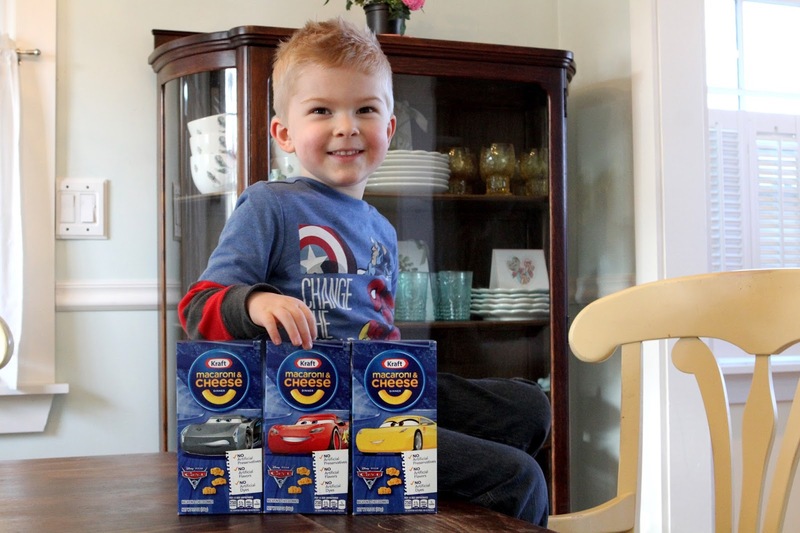 Other things you can expect to see real soon (if history repeats once again) are Cars 3 Band-Aids, breakfast cereal, fruit snacks, candy and yogurt (mostly food items). After that we'll start to see a ton of random stuff here and there like kids tees, swim gear, bed sheets, sun glasses, toothpaste, etc. 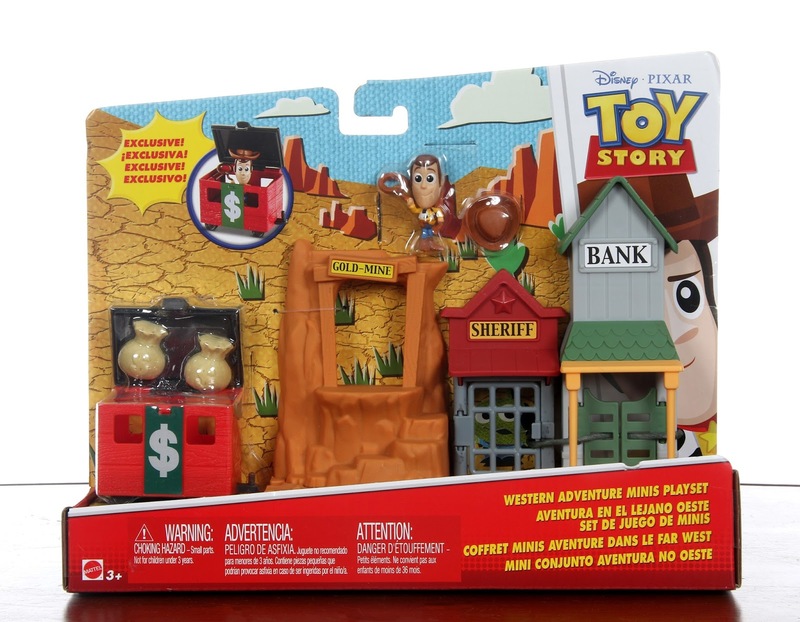 Once May hits, the official toy lines, games and books will hit (which is the stuff I'm pumped for). 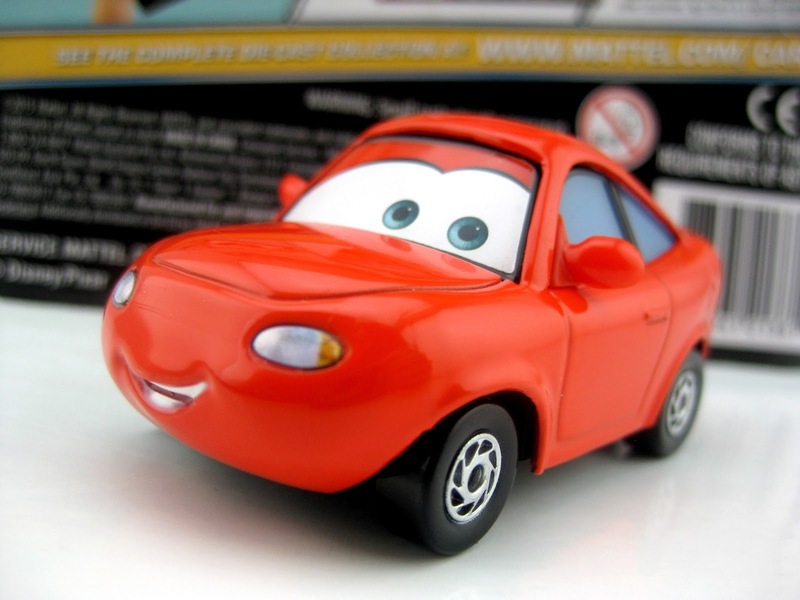 Are you excited for Cars 3 merchandise? What are you most looking forward to? Let me know in the comments below and look for more updates right here soon! In celebration of the Disney Store's 30th anniversary this year, guests visiting the Disney Store can now collect these four commemorative trading cards FREE! 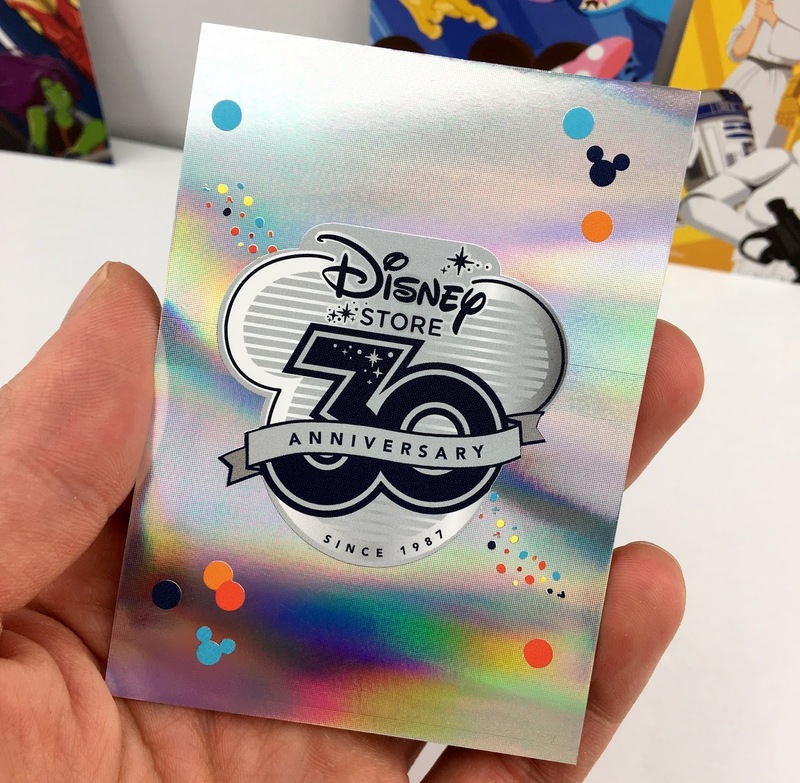 All you have to do is participate in one of the new "Disney Store 30th" trivia challenge events and you'll receive a card. Ask any cast member at your local Disney Store for details on event times and how you can complete your set (if you want all of them). Who doesn't like free Disney stuff right? These cards represent Disney's four main current brands/properties: Marvel Studios, Pixar Animation Studios, Walt Disney Studios and Lucasfilm. Each card has a really awesome looking illustration on the front (you know me and my love for cute minimal designs!) and a neat iridescent foil back featuring the 30th Anniversary logo. Of course since this is a Pixar site after all, I'm gonna specifically hone in on the Pixar card (the one I was most excited to see). So cool! 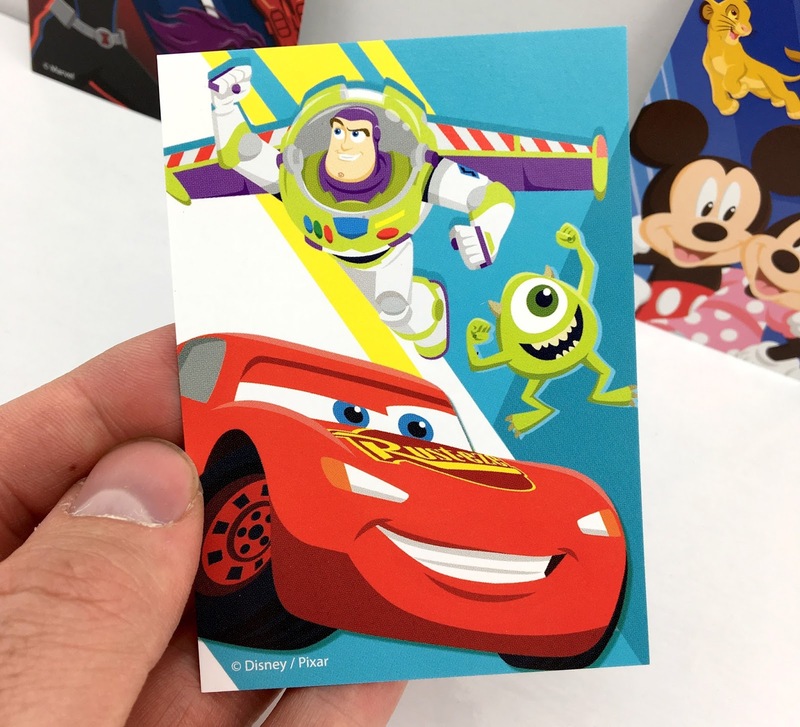 Again, I love the artwork here and love that three of my all time favorite Pixar characters/films happen to be represented: Buzz Lightyear, Mike Wazowski and Lightning McQueen! Great choices. I wish I knew who the artist is, but unfortunately I couldn't find any info. If you're a fan of these designs, definitely check out the rest of the Disney Store 30th collection before it's gone! You'll find a water bottle, a a journal, a note card set, a reusable tote and t-shirts for men, women and children. 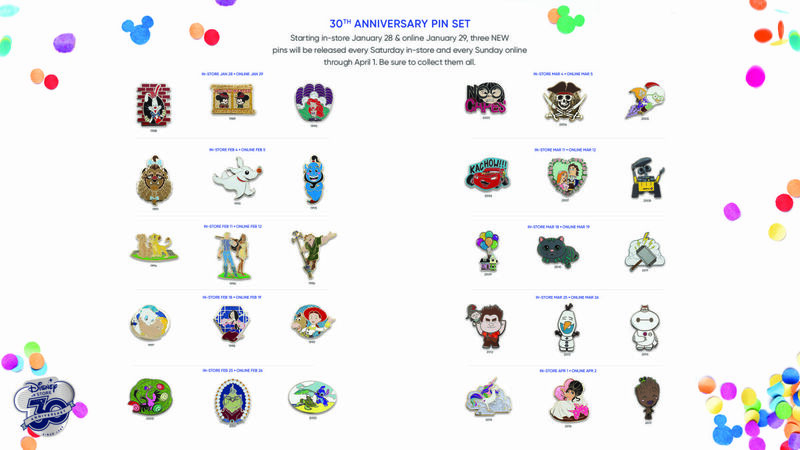 Also, if you haven't already, check out my post HERE for more on the 30th anniversary pin sets as well. Were you able to grab any of these cards? Let me know your thoughts in the comment below! Hello everyone! I know I mentioned today's post here was supposed to be yesterday's post, so thanks for bearing with me. With the amount of photos this post has, as well as work I was doing on an extensive unboxing of these as well (which will be linked at the bottom), this one took a bit more time than I anticipated. Without any further ado, here we go! I'm super thrilled to be giving you a detailed look at the brand new Toy Story "Minis" playsets, just released by Mattel! To catch up on my previous posts featuring more from this fantastic collection, be sure to check out the minis figure 10-pack HERE, blind packs series 1 HERE, blind packs series 3 HERE and the minis vehicle sets HERE. Last week I received a message from one of my Twitter followers (thanks Nick!) letting me know these hit Amazon. I was so excited and ordered them within seconds. I received them Monday and have been working on getting this post done since! UPDATE: Tonight I found them at my local Toy R Us as well. 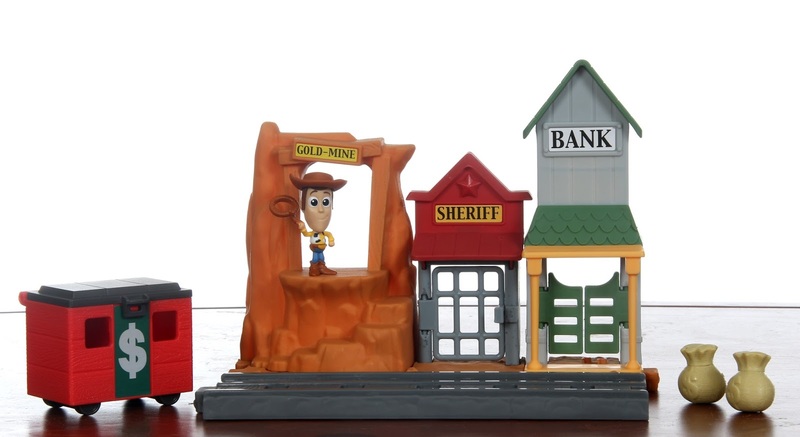 The two minis playsets we have here so far are called "Andy's Room" (based on, well, Andy's room in the original film) and "Western Adventure" (loosely inspired by Toy Story 3 with maybe a little bit of Woody's Roundup mixed in). Both sets are, of course, very small (measuring around 9" long and 4.5" tall) and retail for $14.99. Let's take a closer look at each one! First of all, again, the packaging here with these is so cute. I love the style! 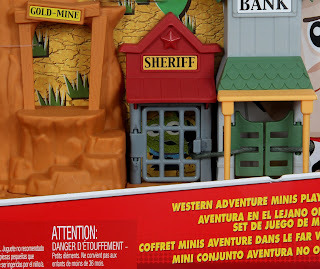 The minimal artwork is adorable and all the little details are great (for example, the eye patch alien behind the jail cell as seen below; could that mean a minis figure of that character is on its way soon??). It pained me tearing the packaging up for my unboxing video, but I wanted to show you all the sets out of their boxes and in action! 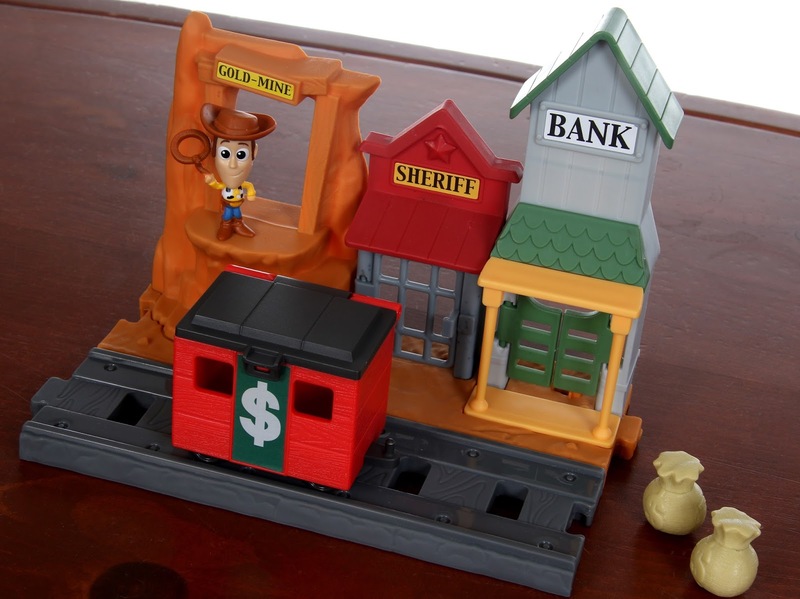 This particular set comes with the main buildings structure (featuring a gold-mine, sheriff's office and bank), a money railroad car (which opens up), two money bags, a piece of railroad track (which can snap into any side of the playset) and an exclusive lasso Woody minis figure (with removable hat). Check it all out! What's really neat, and for added fun, the minis "Western Train" vehicle (seen in my post HERE) can be combined with this set and connected to the money boxcar! Makes for a cool little expansion. Open up the money car from the top and store the two plastic money bags inside. But watch out for the evil One-Eyed Bart and One-Eyed Betty! They're after the gold. 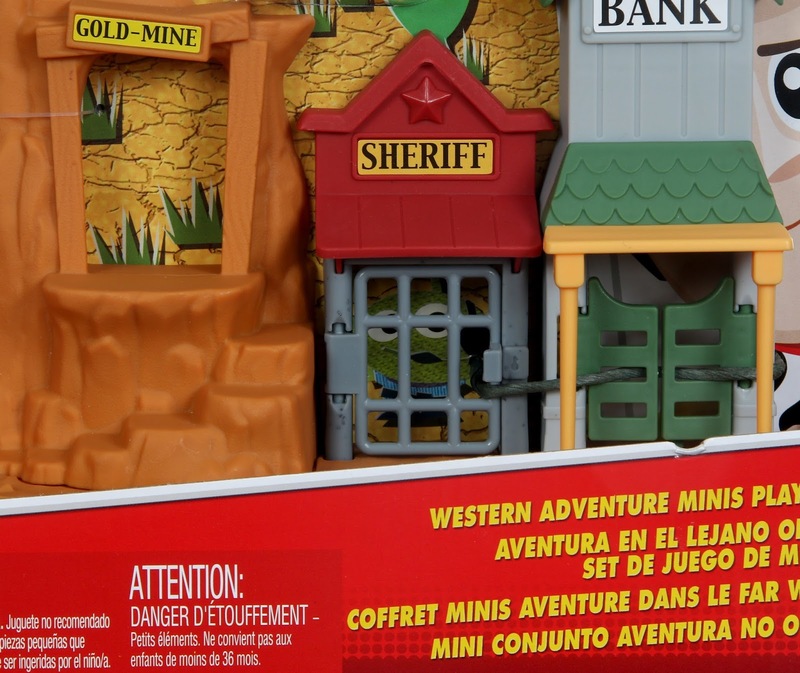 Now we're gonna take a look at the Andy's Room minis playset. 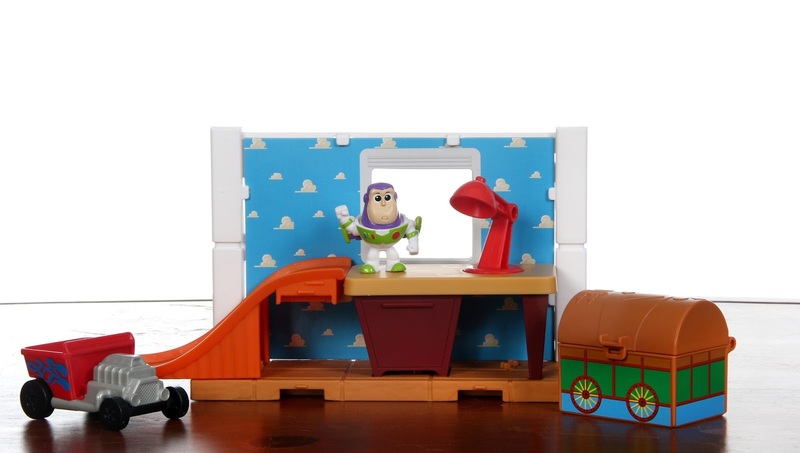 Here you'll find Andy's signature cloud wallpaper, his desk and lamp, his orange "Hot Wheels" track, his iconic toy box, an exclusive Buzz Lightyear minis figure (the first one with his wings out to date) and the Red Baron "Hot Wheels" car for Buzz to ride in. The only bummer with this set is that I thought it came with an exclusive shark with Woody's hat figure (seen coming out of the toy box in the package above). It turned out to be just a cardboard display piece, but it makes me think that we could be getting an actual shark minis figure very soon! If Woody starts getting jealous of Buzz and tired of his "flying", "laser", "quality sound system" and "impressive wing span", you can use the swiveling lamp on the desk to help knock him out the window! 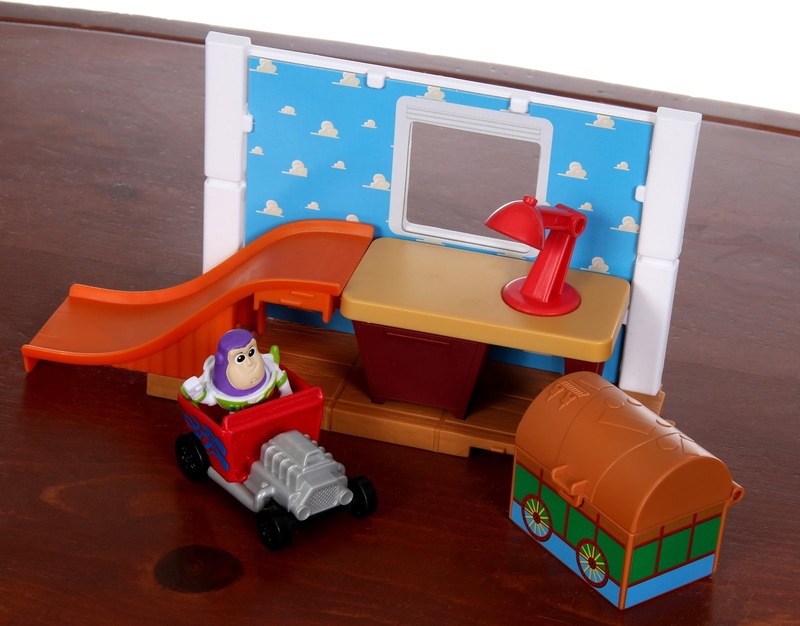 "Fall with style" by sending Buzz and the Red Baron car down the "Hot Wheels" ramp! 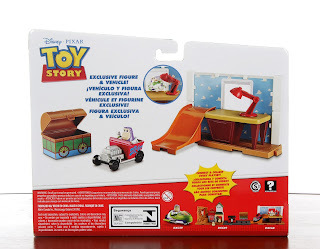 As seen on the back of the box above, you can also remove the ramp and switch it so it connects to the desk facing forward. 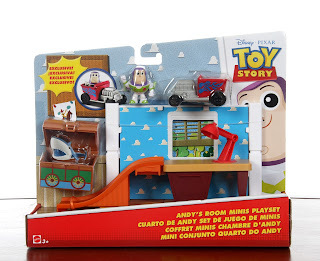 Also, Andy's toy box opens up and you can fit two to three minis figures inside. I absolutely love the look of these sets and all the fun accessories and play features. Best of all? They both can connect (in more than one way) for maximum fun! 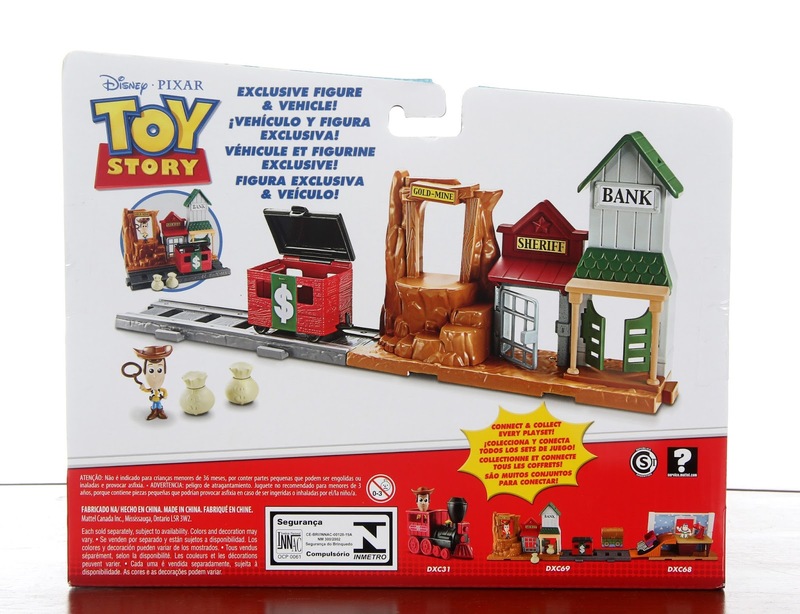 I'm assuming more playsets are in development and I'm hoping for another release real soon. I'm sure we'll be able to connect any new sets to what we have here so far and I really look forward to expanding this little Toy Story playset world with new locations. What could be next? Pizza Planet? 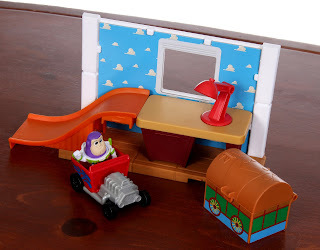 Al's Toy Barn? Sid's Room? Zurg's fortress? Sunnyside Daycare? So many possibilities! Shout out your ideas/hopes for this series in the comment section below. I'd love to hear your thoughts. Finally, here's my YouTube unboxing video! Check it out to see these in action and feel free to "like" and subscribe for more content. :) Thanks so much for the support! 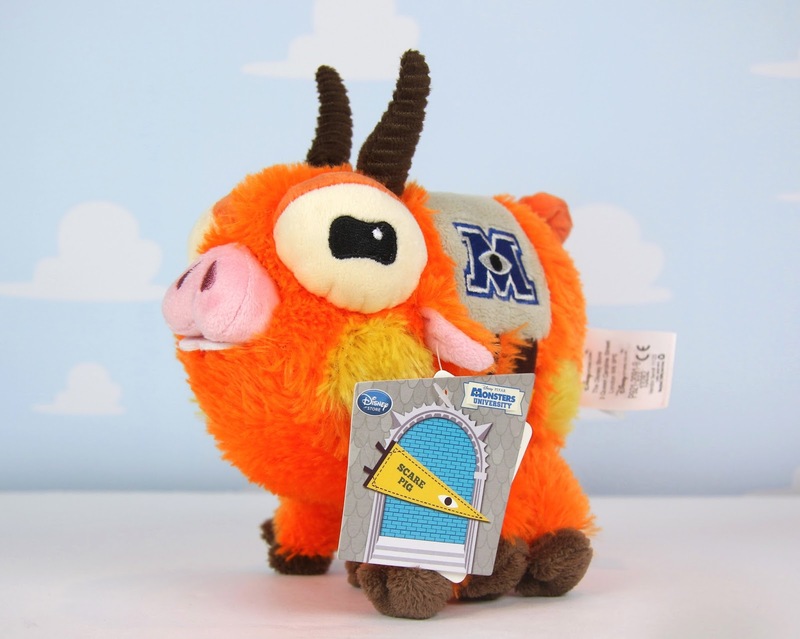 This past Saturday I started my reviews of the 2013 Monsters University Disney Store mini bean bag plush (which began with Archie the Scare Pig). Today I'm continuing on with two more from the collection...Brock Pearson and Claire Wheeler! In the film, Claire is the president of the Greek Council, while Brock serves at the vice president. Both take part in emceeing the annual MU Scare Games. These are both super cool and very unique plush. The only other products I have for either of these characters are the "monster mini" figures from Spin Master (seen HERE). 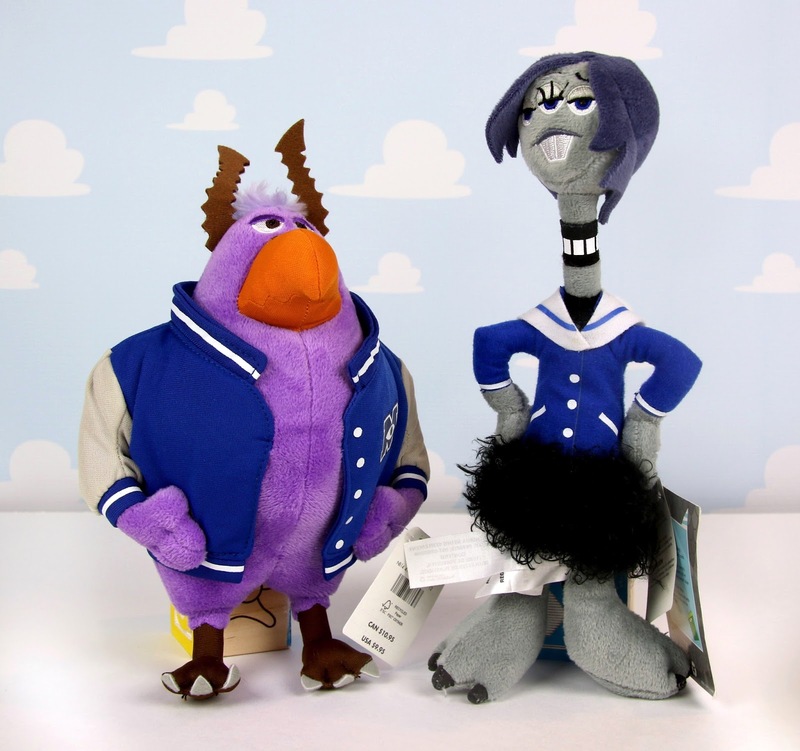 Other than those figures and these plush, I don't believe there are any other items out there of Brock and Claire. That alone made these a must have for me. I always thought Brock's preppy, over the top energy in the film was pretty hilarious and found his look to be pretty cool and much different than any of the other monsters seen on screen. I had to have this one! I'm indifferent about Claire honestly (as a character), but I couldn't have one without the other of course. Both plushies have very decent likenesses, details and embroidered features. The fabrics/materials used here are really nice and you can tell these are quality made overall. Brock stands at 9" tall (including the horns) and Claire at around 10.5" tall. Both originally retailed for the standard mini bean bag plush price of $9.95. That's it for these guys! If you're looking to add these to your collection, check out this direct link to current eBay listings (they're very easy to track down for surprisingly cheap). Let me know your thoughts in the comments below and thanks so much for dropping by! If you didn't know this already, this year marks the Disney Store's 30th anniversary! To celebrate this milestone, the Disney Store has a bunch of exclusive merch lined up— including 30 never before released limited edition pins commemorating Disney (mostly animated) feature films from 1988 through 2017. They are being released every Saturday for 10 weeks straight; the dates ranging January 28th through April 1st (as seen in the graphic below). The pins come in sets of three for $19.99. Each pin represents a different movie which corresponds to a specific year (the pin sets are being released in [movie] chronological order). With that said, yesterday was the release of the week four pin set which includes Hercules (1997), Mulan (1998) and Toy Story 2 (1999). 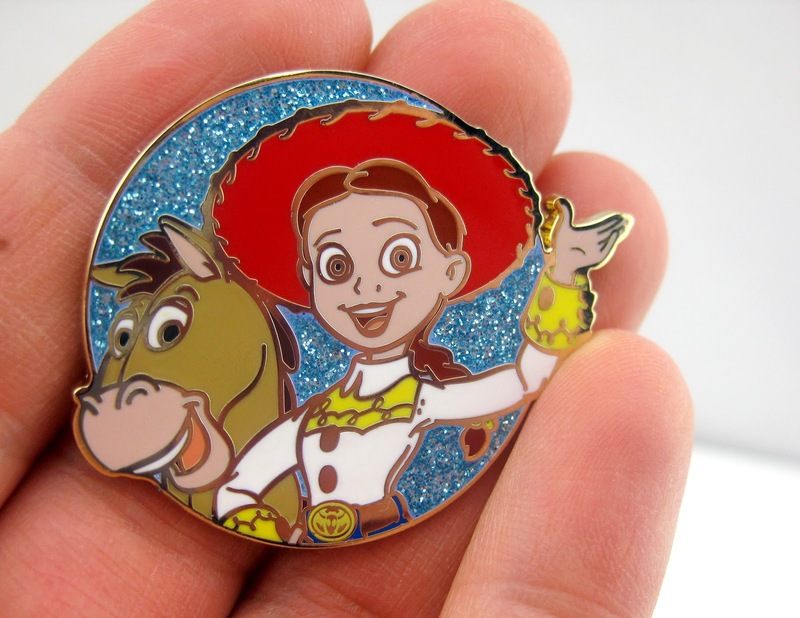 Today I'm taking a closer look at the Toy Story 2 pin, featuring Bullseye and Jessie, which I was able to get my hands on! Disclosure: I didn't actually fork out for the full pin set just to get this one pin. One of my generous managers at the Disney Store I work at actually bought the set for herself, but didn't have any need for this Jessie one. Because she knows my love for Pixar, she gifted it to me! It was an extremely kind gesture and very much appreciated. 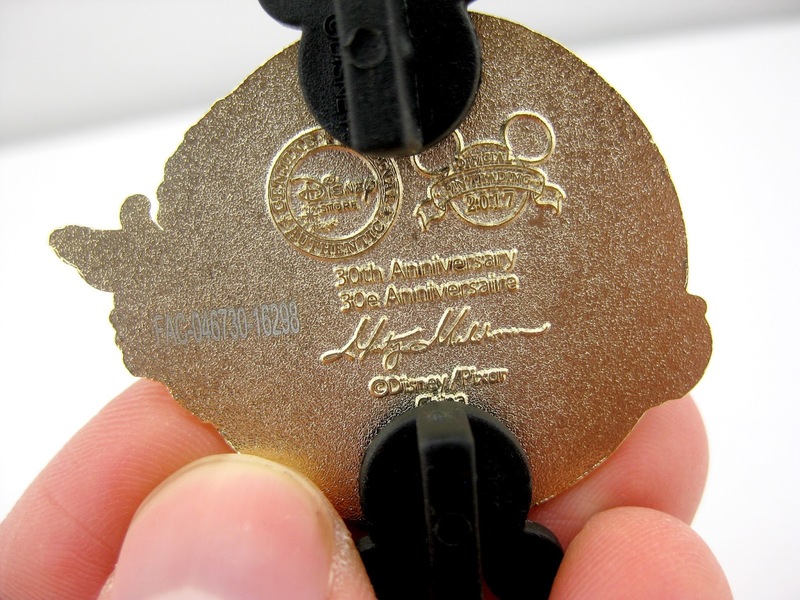 On the back it you'll spot the "Disney Store Genuine Original Authentic" logo, the "Official Pin Trading 2017" logo, text reading "30th Anniversary" and the artist's signature (who is, in this case, Monty Maldovan). Of course the traditional Mickey Mouse icon pinbacks are included as well. This is actually a really fantastic pin that I wouldn't have otherwise got. I really love the sparkly glitter accents behind the characters which, by the way, looks so much cooler in person! My photo unfortunately doesn't do it justice. I'm thrilled to have this as part of my small Pixar pin collection. This whole set completely sold out yesterday (in stores and online), however eBay sellers have already begun listing it. Check out current listings right HERE if you're looking to add this pin/set to YOUR collection! Today's the beginning of my detailed look at the entire 2013 Monsters University mini bean bag plush collection from the Disney Store...starting now with Archie the Scare Pig! 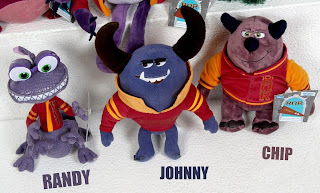 Over the next couple weeks, I'll be showing you guys all the awesome fraternity, sorority and other mini MU plush that were released around the debut of the film. Note: if you missed my "medium core" Oozma Kappa plush post from back in November, check it out HERE. I also reviewed the medium Mrs. Squibbles plush HERE and Mike & Sulley HERE. In the film, Archie was originally [rival school] Fear Tech's mascot; that is until Sulley stole it and made it MU's own (with the help of Mike, who got no cred I might add). I've always been a fan of this hilarious side character. Though he doesn't get more than a few brief moments of screen time, his completely goofy look and little pigs sounds never fail to crack me up. This plush was a must have for me! There you go! That's this guy in a nutshell. If you wanna pick this one up for your collection, be sure to check out this direct link to current eBay listings or Amazon using the link below. 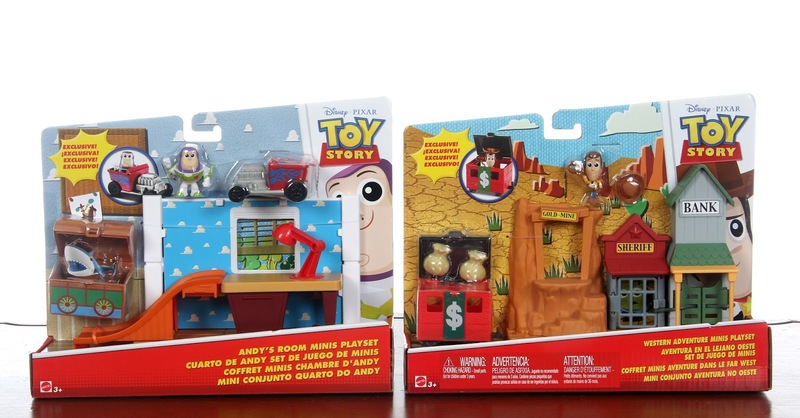 The adorable Toy Story "Minis" collection continues with these brand spankin' new vehicle sets from Mattel! If you haven't checked out my previous posts on this popular series, be sure to catch up HERE (for the 10-pack), HERE (for the blind packs Series 1) and HERE (for the blind packs Series 3). 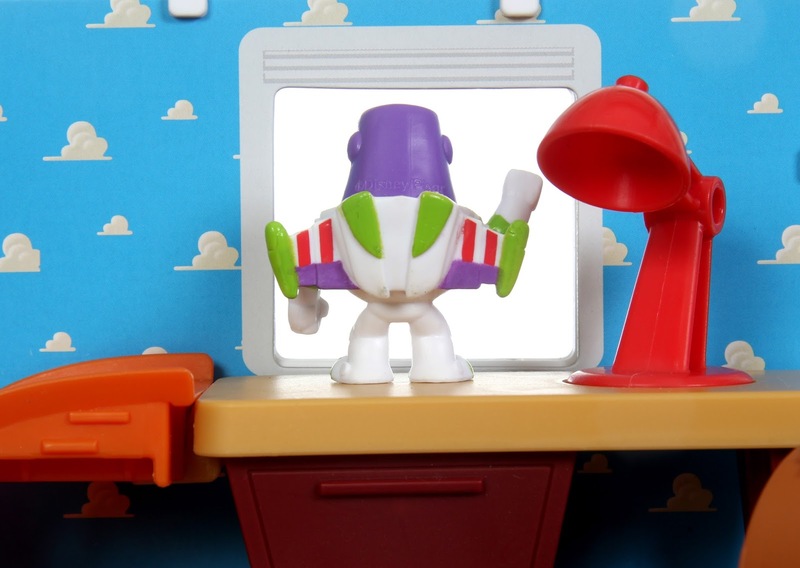 Each of these Toy Story inspired vehicles include one exclusive figure. 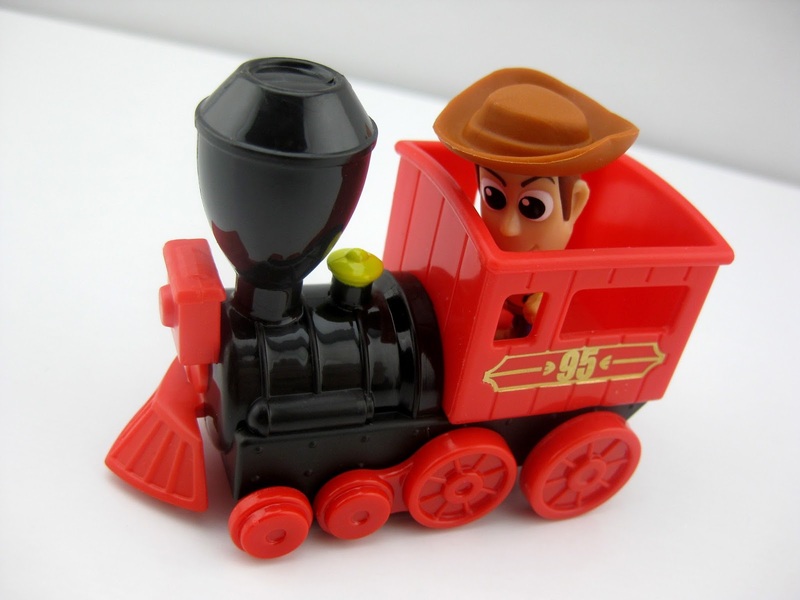 We have the Western Train with [pointing finger] Woody, Spaceship with [aiming laser] Buzz Lightyear, Pizza Planet Truck with [new design] Alien and RC with [remote control] Woody. I was able to find all four at Toys R Us earlier this week for $5.99 a piece. When they say mini, they mean mini. There are very small figures that stand just over an inch tall, are made of hard plastic and have very limited articulation (as in most of their heads and turn, but that's about it). 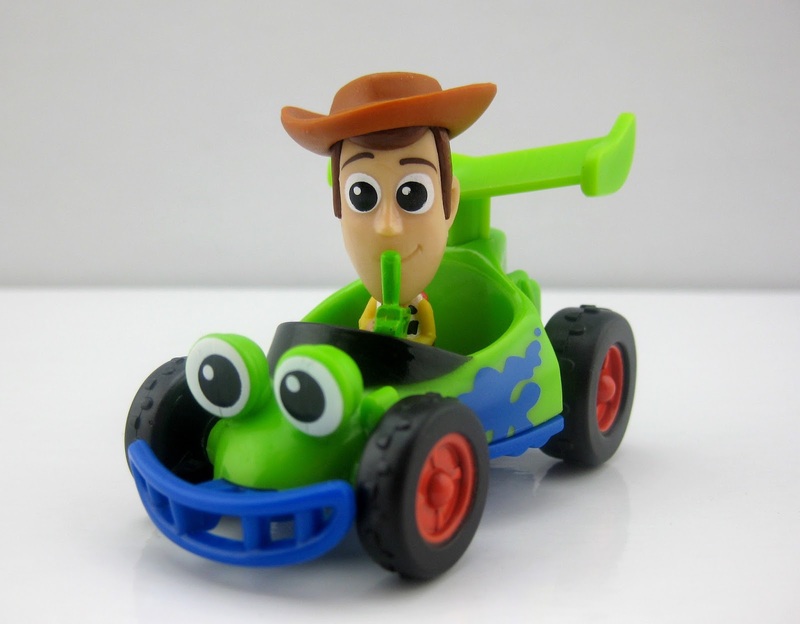 Their vehicles are also very tiny (at around 3" in size) and feature rolling wheels. Let's look a bit closer of these guys out of their packages! 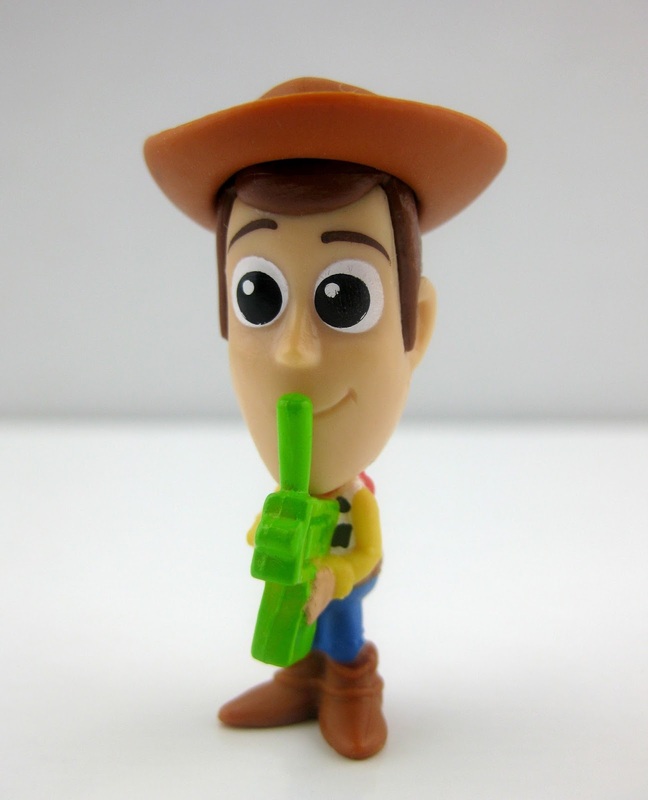 This Woody is just a tad different than the previously released standard Woody. This one is pointing his finger and has a more stern expression. His hat is removable. This alien is also very similar to the original, but if you compare the two, you'll notice this one is an entirely new sculpt. 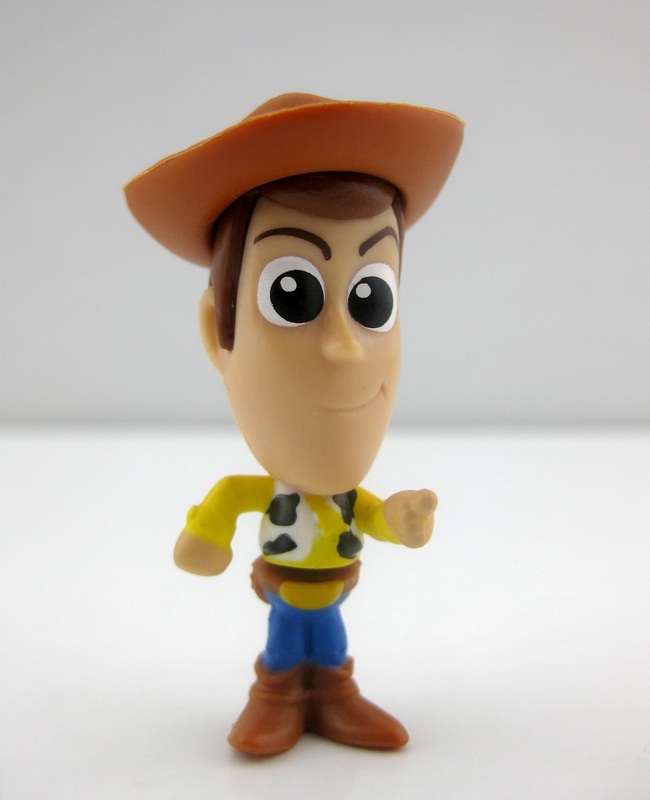 His eyes, mouth and belt are different and his arms are in a different position. 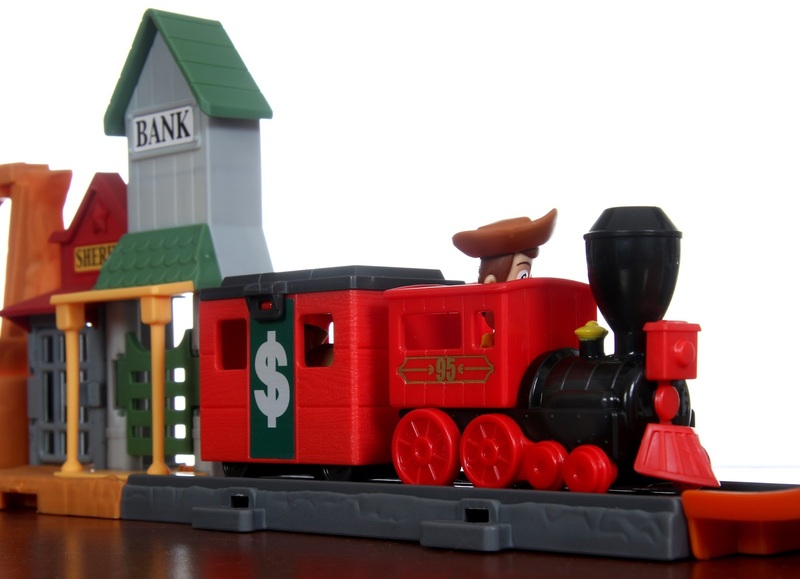 Again, this Woody is all new. Of course the main difference here is that he's holding RC's remote control, but his facial expression also differs from the two other versions. Like usual, his hat is removable. This Buzz is, again, brand new. His stance and facial expression (with the one eye closed) are as if he were aiming his laser. Pretty neat! He also has a blue belt, which seems to be the utility belt that the deluded Buzz in Toy Story 2 wore. 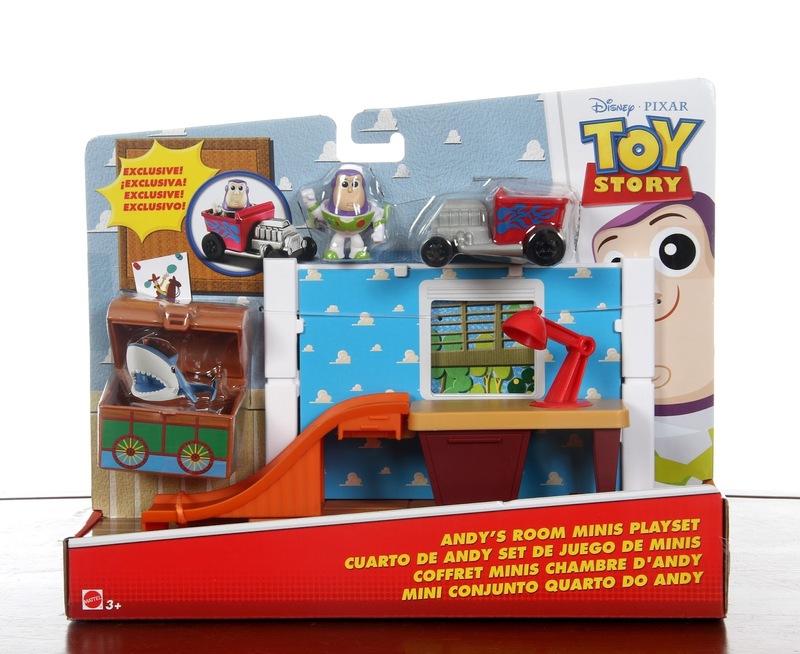 I'm not sure if that's what they were going for (since his packaging shows Andy's room), but that's my best guess. I was so excited when I finally spotted these at the store on Tuesday. 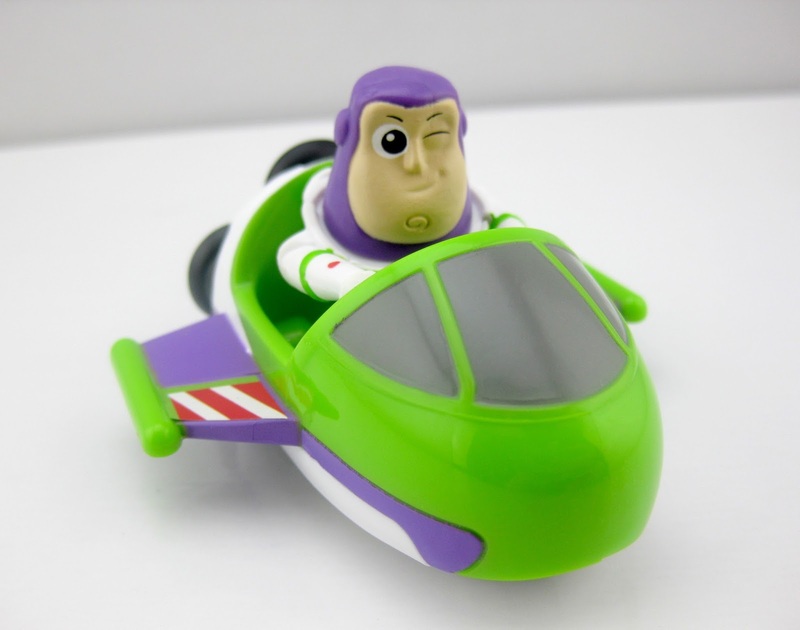 There was only one of each pack, except the Buzz with spaceship (there were three of those). At first I didn't see the train and I was bummed I was going to have to settle for three out of the four, but then I found it laying on the shelf elsewhere behind a few things! If you or your little ones are into collecting this series, I can't recommend these enough. They look so cute and awesome (not to mention the added play value)! 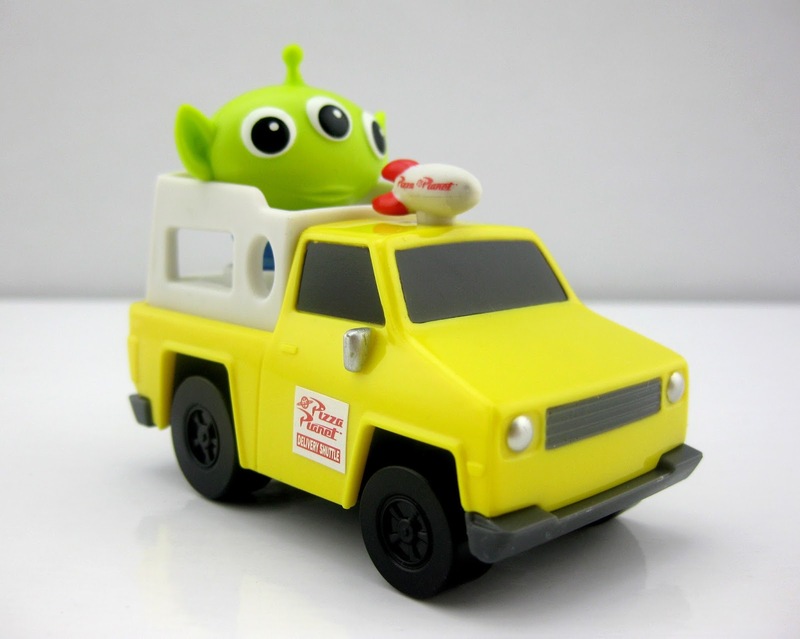 I'm a sucker for anything related to Pizza Planet Truck merch, so that has got to be my favorite. What's yours? Be sure to check your local Toys R Us today for availability. Best of luck on the hunt!